These tracks show a six-muon event in the MINOS far detector. The MINOS detectors at Fermilab and in Soudan, Minnesota, were built to study neutrino oscillations over a vast distance. But it turns out that they are also powerful cosmic ray muon detectors. When a cosmic ray strikes an atom in the Earth’s atmosphere, it sets off a cascade of particle decay, creating kaons or pions, which in turn decay into muons. MINOS previously made the first deep measurement of the ratio of positive to negative muons arising from cosmic ray showers, and that number is related to the ratio of positive to negative cosmic shower kaons. That, in turn, has implications for the predicted rates of neutrino detection in neutrino telescopes such as IceCube. MINOS also measured how the cosmic ray muon rate changed with the seasons of the year. It is well known that this rate fluctuates a few percent, being higher in summer when the higher temperatures lower the atmospheric density, which allows for more pion and kaon decay. MINOS was able to correlate this with temperature and demonstrate sensitivity to the ratio of pions to kaons. This ratio happens to be important for calculations of neutrino rates from targets in beams, such as for MINOS itself. Now MINOS has made a new measurement of the seasonal variations of underground multiple-muon events. These events come from cosmic ray showers in which two or more muons penetrate the Earth and appear as parallel tracks in the detector. In the far detector, about a half mile below the surface, the multiple muons that were within about 13 feet of each other had a maximum rate in the winter, while the events in which muons were separated by 20 or more feet had a summer maximum. The difference in depth between the near and far detectors affects the minimum muon energy needed to penetrate the rock and reach the detector. Sophisticated simulations of cosmic ray air showers exist but do not currently include seasonal effects. The understanding of this unexpected result will require new simulations or new data. It would be a wonderful coincidence if, once again, the reason turned out to be useful for the neutrino community. Multiple-muon events — events in which two or more muons simultaneously penetrate the Earth — seen by the MINOS near detector take a dip in the summer (top). 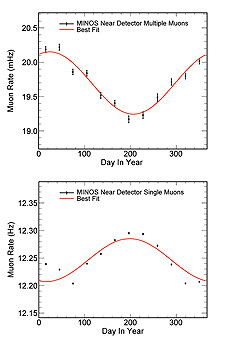 By contrast, single-muon events detected by the MINOS near detector rise in the summer (bottom). The results, accepted for publication as a rapid communication in Physical Review C, leave open the possibility that something even more unusual might explain the anomalous experimental results, the only known deviation from a prediction of the long-standing, thoroughly tested Standard Model. 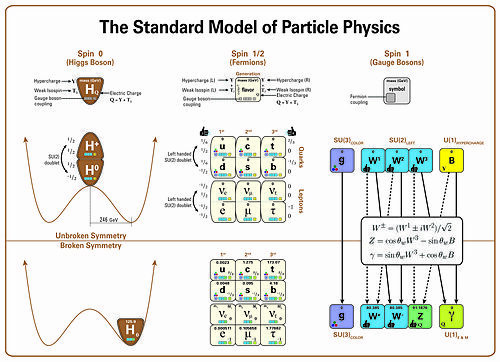 The Standard Model of elementary particles (more complete depiction), including the Higgs boson, the three generations of matter fields, and the gauge bosons, as well as their properties and interactions, and the effect of spontaneous electroweak symmetry breaking by the Higgs field. Alternatively, they could indicate a problem with the muon experiment—an idea that scientists will soon get a chance to test—or that dark photons have properties not detectable by the current experiment. Particles produced by cosmic rays enter volcanoes and live to tell the tale. Exploring the innards of Mount Vesuvius, the active volcano that once destroyed the ancient town of Pompeii, sounds like a risky endeavor. Unless you’re a muon. Scientists from institutions in Italy, France, Japan and the United States are using muons, the big brothers of electrons, to study the structure of Mount Vesuvius and other volcanoes in Italy, France, Japan and the Caribbean. Muons are particles produced in the constant shower of cosmic rays that interact with Earth’s atmosphere. If you hold out your hand, a muon will pass through it about once per second—and it will keep on going. The highest-energy muons can travel more than a mile through solid rock. “[Studying volcanoes with muons] should help in giving information on how an eruption would develop,” says scientist Giulio Saracino of INFN, Italy’s National Institute for Nuclear Physics, who is a member of the MU-RAY experiment at Mount Vesuvius. Researchers say the measurements could be used in conjunction with other methods to identify areas of greatest risk based on concentrations of lower-density rock susceptible to fracture in an eruption. 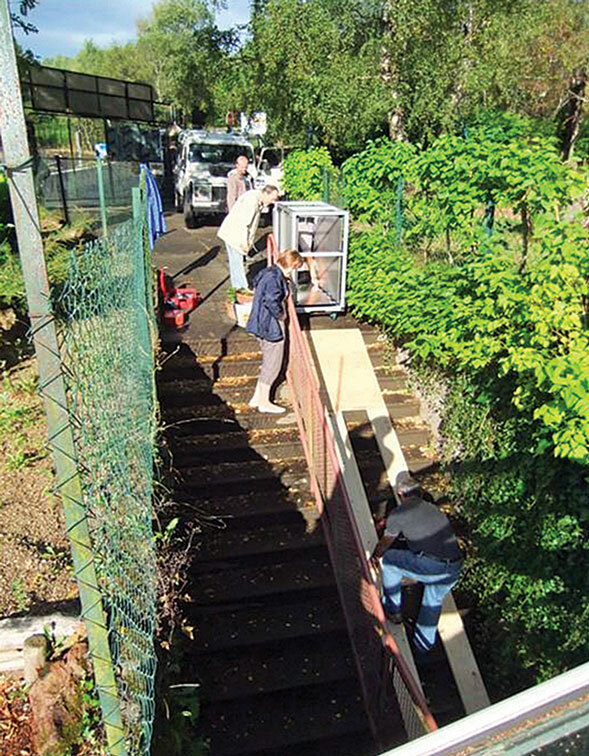 In May 2013 MU-RAY scientists took a 1-square-meter prototype of a muon detector to a research station at the foot of Mount Vesuvius for a technical run. 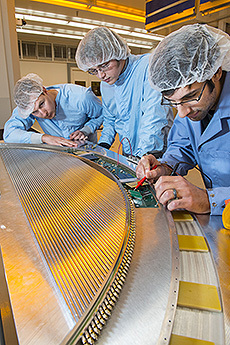 The detector is an advanced version of technology used in physics experiments at Fermi National Accelerator Laboratory and Gran Sasso National Laboratory. A handful of researchers, assisted by local high school students in the delivery and setup of equipment, completed the installation in about three workdays. Geologists and volcanologists have amassed an array of tools to study aspects of volcanoes: satellites, seismic readers, laser surveying kits and equipment to monitor gases, gravity fluctuations and electrical and electromagnetic signals. Nobel Laureate Luis Alvarez of the University of California, Berkeley, pioneered the muon radiography technique used on volcanoes in the late 1960s when he used it to look for hidden chambers in the Great Pyramid of Chephren in Egypt. In 2007, scientists used it to image the interior of an active volcano, Japan’s Mount Asama, for the first time. “This is quite unique compared to other survey methods,” says Valentin Niess of CNRS, the French National Center for Scientific Research, and a member of the TOMUVOL collaboration, a group of about 30 scientists studying the long-dormant Puy de Dôme in France. 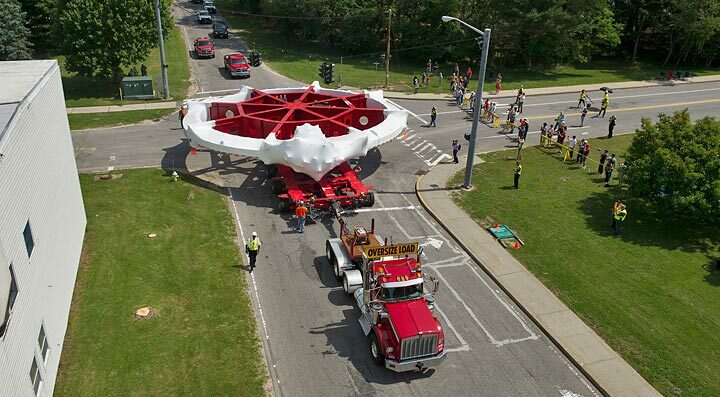 Last year, a monster magnet set out from Brookhaven National Lab on an epic, 35-day trek by land and sea to its new home at Fermilab, where it will serve as the heart of a search for evidence of new subatomic particles. 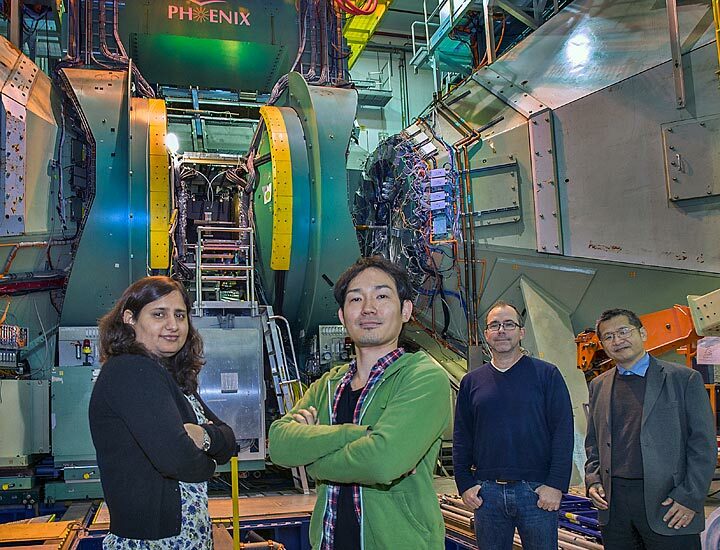 Last month, with much less fanfare, researchers came to the End Station Test Beam (ESTB) facility at the Department of Energy’s SLAC National Accelerator Laboratory to test the eyes and nerves of the same experiment: a cutting-edge design for a new detector. Muon g-2 magnet to be transported to Fermilab. The goal of the experiment, called Muon g-2 (pronounced gee-minus-two), is to precisely measure a property of muons by studying the way their spins precess, or wobble like a slowing top, in the grip of a powerful magnet. Researchers can track this spin by observing the muon’s decay into electrons, their lighter, longer-lived siblings. In the experiment’s original incarnation at Brookhaven, researchers discovered the spin rate is a tiny bit different from what theory says it should be – a difference that could indicate the influence of unknown virtual particles that pop into existence from the vacuum, affect the muons, and disappear once more. However, the researchers at Brookhaven weren’t able to measure the property precisely enough to know for sure. 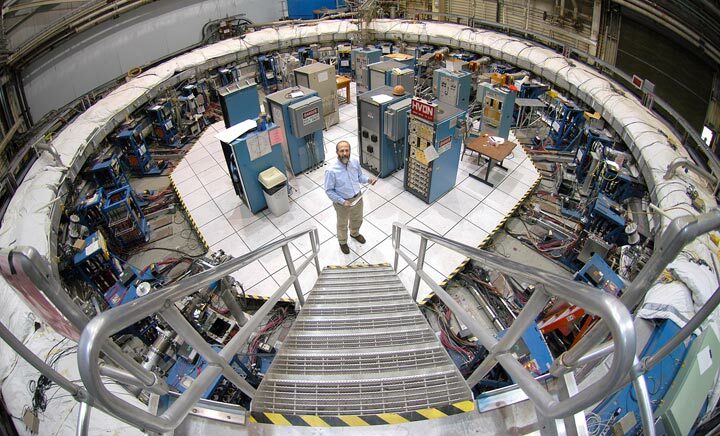 That prompted the relocation of the experiment – including the headline-grabbing move of the giant ring magnet – to Fermilab, with its more powerful muon beam. To take advantage of more muons, and thus more data, a team led by University of Washington physicist David Hertzog developed a new detector design for the experiment, a novel combination of lead-fluoride crystals and silicon photomultiplier chips that they hope will capture more information about the escaping electrons. Hertzog and his colleagues brought some of the crystals and silicon chips to SLAC’s ESTB facility, where electrons from the linear accelerator could stand in for the results of muon decays – but controlled and easily tracked muon decays, unlike what the detectors will face during the actual experiment. The tests at ESTB have been much more low-key than the magnet’s 3200-mile trek, but Hertzog said his team can also look back at a successful venture. If you take an electrical charge and set it in motion, you create a magnet. This is true in both the world of ordinary experience and the quantum world, although the details there are a bit trickier. The simplest quantum system is a single, moving charged particle — say an electron or a muon. While I could select either type of particle for this article, for reasons that will become clear, I concentrate on the muon. Subatomic particles like the muon have both electrical charge and quantum mechanical spin. Quantum mechanical spin differs a bit from ordinary spin, but it has the same consequence: the spinning muon acts like a magnet. The magnet has a specific strength, determined by the charge of the muon and the fact that it is a spin-1/2 particle. Together, the spin and strength produce an effect that scientists call the magnetic moment. The prediction of the magnetic moment of the muon (and electron) was first given by Paul Dirac. The measurement involves something called the g factor, and the value of g was predicted to be 2. The way scientists search for deviations from predictions is to measure the quantity (g-2)/2. If the particle had the exact magnetic moment predicted by Dirac, this quantity would be exactly zero. Early measurements of the muon’s g factor showed that it differed from predictions by 0.1 percent. Such a small difference between theory and measurement could be due to measurement or calculation error. However, the predictions and measurements are now very precise. For muons, the measured value of (g-2)/2 is 0.0011659209, where the measurement uncertainty is only in the last “9.” That means that all the other numbers are meaningful: The measurement is accurate to one part in ten billion. This is equivalent to measuring the circumference of the Earth at the equator to a precision of just under a quarter inch. So what causes this 0.1 percent difference? There are many names for it, and two such names are virtual particles and quantum foam. In short, empty space isn’t empty space. At the subatomic level, particles are popping in and out of existence like the bubbles in foam. These particles are found in a more concentrated way near particles such as muons. You can think of these virtual particles as bees swarming surrounding a particularly aromatic flower (the muon). These virtual particles alter the strength of the muon’s magnetic field. Scientists can calculate the effect of these virtual particles, and they agree very well with data to high precision. However, the theory and experiment don’t agree perfectly. 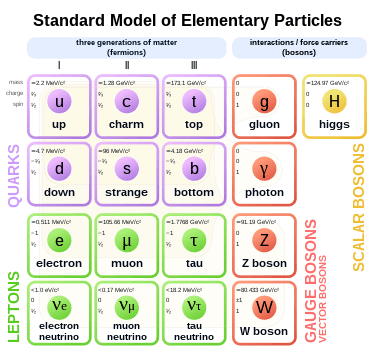 Given the precision of the prediction and the measurement, it is possible that this discrepancy might be the signature of physics beyond the Standard Model. The Fermilab Muon g-2 experiment will study the magnetic moment of muons with greater precision than has been possible in the past. 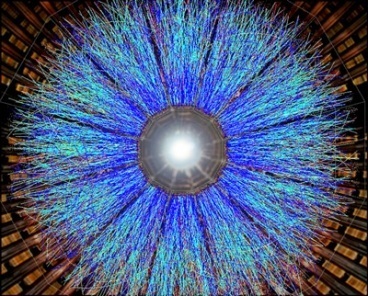 If the discrepancy remains and the uncertainty decreases, it may be that research involving spinning muons might yield the measurement that turns a possible crack in the Standard Model into a broken dam through which a new theory rushes and changes everything. This month, scientists of the Muon Accelerator Program celebrated the arrival of a U.S.-supplied magnet and six tons of RF hardware at the Muon Ionization Cooling Experiment (MICE), located at Rutherford Appleton Laboratory in the UK. The experiment’s goal is to demonstrate the feasibility of shrinking the size of a muon beam with a process called ionization cooling. Creating compact muon beams is a crucial step toward future muon accelerators and [muon] colliders*. In ionization cooling, muons are cooled by sending them through absorber materials made of light nuclei (such as hydrogen) and then are reaccelerated using RF cavities. This process can be repeated many times and reduces the transverse momentum of each muon relative to its longitudinal momentum. In 2015, MICE scientists will begin key experiments that will characterize the interactions of muon beams with various absorbers. The muon trajectories will be carefully measured using scintillating fiber tracking detectors embedded in spectrometer solenoid magnets located at the beginning and end of the cooling beamline. A subsequent experimental configuration, expected to be in operation later in the decade, will employ a full “cooling cell” with suitable absorbers, focusing solenoid magnets and multiple RF cavities to characterize the evolution of the beam’s emittance as the beam travels through a whole sequence of devices. 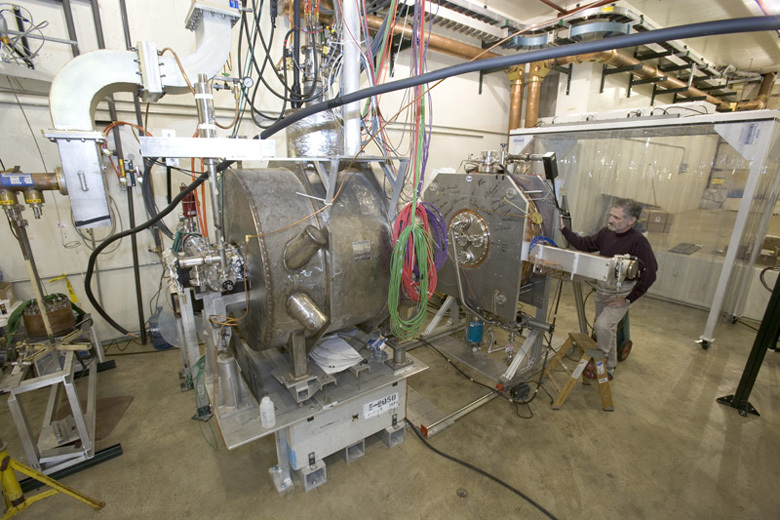 In support of these R&D efforts, the DOE-funded U.S. Muon Accelerator Program is providing two spectrometer solenoid magnets and two coupling coil magnets, as well as RF and detector hardware for the experiment. The NSF has provided additional support for U.S. participation in the experiment.